On November 13, 14 and 15, is celebrated the eighth edition of the Smart City Expo World Congress (SCEWC), the most important fair in the Smart Cities sector, takes place in Barcelona. 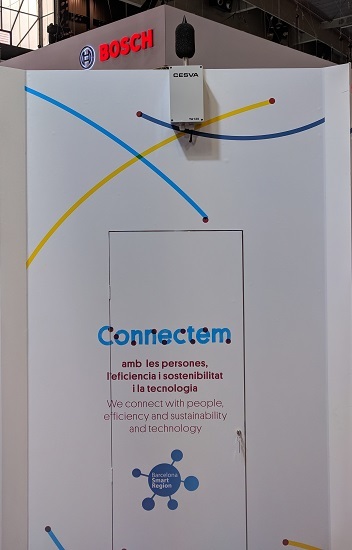 This year, CESVA is present with the TA120 noise sensor, at the stand of the Diputación de Barcelona, ​​within the Smart Region project with the Sentilo platform. Smart Region, is an initiative that aims to improve the quality of life of citizens, in a sustainable environment both from the economic and environmental point of view, through the use of technology that allows a more efficient management of services. The platform for the management of urban services is an open source solution for the collection of sensor data, from which the Diputación de Barcelona has developed a multi-city function for the municipalities of the demarcation. From the own cloud of the Diputació de Barcelona to the municipalities that request it. In this connexion, the TA120 noise sensor offers the precision of a class 1 sound level meter and the latest Internet of Things (IoT) technology. The TA120 has already been used in several noise monitoring projects in works, leisure areas (ZAS), infrastructures, quiet areas and action plans monitoring and is currently a reference in the Smart City sector.